Weiqi Chuji Jieti Xunlian (Wei2 qi2 Chu1 ji2 Jie3 ti2 Xun4 lian4) (围棋初级解题训练) (Go Beginner Problem Solving Training) is a set of three Chinese language go books. The books contain only Chinese, no other language whatsoever. However, learning only three Chinese ideograms (?) allows one to read the first part of the heading for each problem: Black first, or White first. Volume 1: ISBN: 7-5009-2189-6 consists of 100 problems. Volume 2: ISBN: 7-5009-2190-X consists of 100 problems. Volume 3: ISBN: 7-5009-2191-8 consists of 50 fuseki problems in which one must choose one of the three moves shown in the problem diagram. There are two answer diagrams per problem: the correct answer, and an incorrect answer. 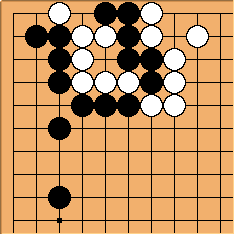 Presumeably, the third possible move is so bad as to not merit discussion. These books should properly be called booklets. The paper is a bit thin, but the contents are solid. Having gone through these three, I think they help give the weaker player a feeling of solidity in play. You also get a sense of direction of play most weak kyus either don't have or don't understand well. The problems in these three books are substantially identical to those in Graded Go Problems for Beginners Volume 2. Although some modifications have been made to the problems (often the orientation of the stones have been changed or the non-essential stones are a little different), my random (and admittedly very limited) sampling failed to find a single problem in this 3-volume series that did not come from GGPFB Vol. 2. Similarly, the problems in the Intermediate (= GGPFB Vol. 3) and Advanced (= GGPFB Vol. 4) volumes of this series also appear to be taken directly from the Graded Go Problems for Beginners Series. I do not know if this is an authorized version of the GGPFB series or not. Volume 3, Problem 50, Black to Play. 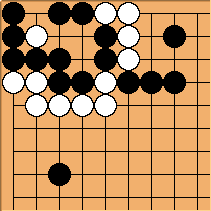 Choose one of the three moves indicated.